Korea has many different types of Ramen. I went to a mart along Daehangno when I was in Korea and bought “Bodeul Chijeu Ramyeon/Boodle Boodle Cheese Ramyeon 보들보들치즈라면” which is endorsed by Nichkhun of 2pm. 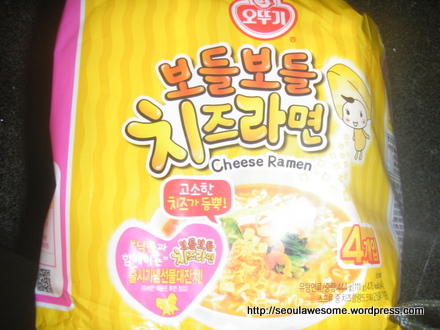 Bodeul Bodeul Cheese Ramyeon belongs to Ottogi Company which specializes in sauces, snacks and instant noodles.